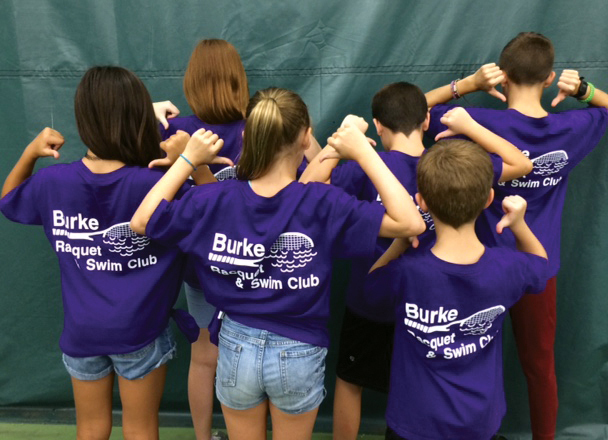 Summer Sports Camps - Welcome to Burke Racquet & Swim Club! Registration for 2019 will begin at 7:00am on Fri., March 1, 2019! For 34 summers, BRSC Summer Sport Camp has kept over 6,000 children busy and happy in a variety of exciting activities. Campers enjoy cooperative games like dodge ball, four corners, and capture the flag to name a few. They also enjoy fun tennis games designed to introduce them to the sport. And, don’t forget our unique indoor Rock Wall and state-of-the-art Exergym. All of this is topped off by instructional-based games in our indoor heated pool. But, what really sets our camp apart are our wonderful counselors. With an 8 to 1 ratio and served with a smile, they are able to give your camper(s) the attention they deserve. Most of our counselors were campers themselves and have grown up participating and volunteering at our sports camp before becoming employees. Because of this, they know what its like to be a camper and how to give your child an awesome summer camp experience. Our camp fills quickly and registration begins March 1st. Please view our brochure for more information and registration details. Better yet, stop by the club today to tour our facility today and discover the best place for children to spend their summer!